HappyFoot massage centers base in prime locations at LKF Central and QRE Plaza Wan Chai. 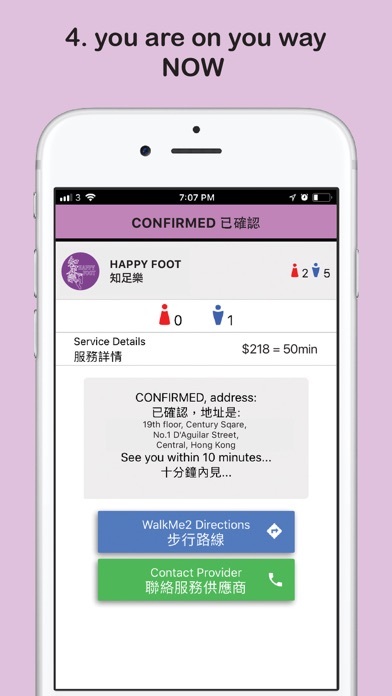 The Happy Foot massage app allows you to request services in the realtime "NOW". We offer a wide range of services such as foot reflexology, Shanghai-Style Pedicure, Lymphatic, pressure point massage and other services at that can be requested instantly. Simple to use - Choose the service you like, select the centre closest to you, select a specific therapist, all the prices are shown in the app, using a few simple taps you are ready to go and enjoy !